Should Platinum Be More Expensive Than Gold? Platinum is one of the rarest elements in the world, much rarer than gold. This is why historically the white metal has been more valuable – just think of platinum credit cards which offer greater privileges and prestige than the gold ones. However, the ‘little silver' has recently been traded at a discount to gold, as one can see in the chart below. 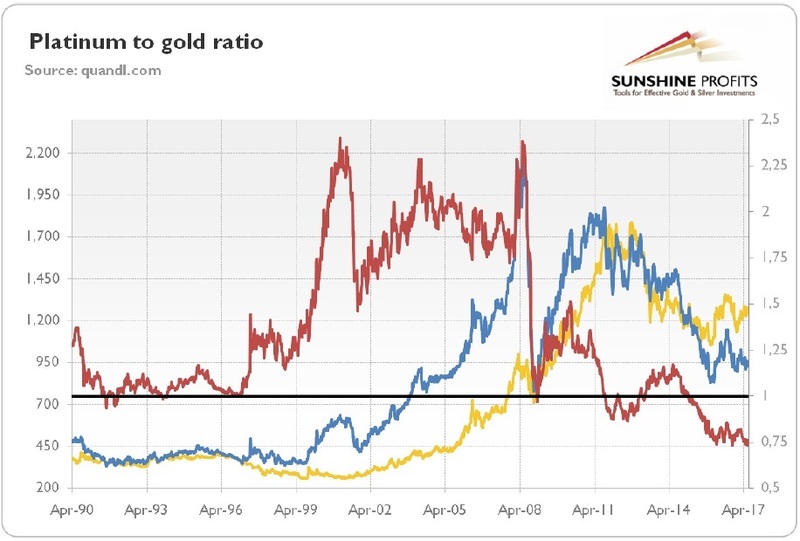 Chart 1: The platinum-to-gold ratio (the price of platinum divided by the price of gold, red line, right axis), the price of gold (yellow line, left axis, London P.M. Fix, weekly average), and the price of platinum (blue line, left axis, London P.M. Fix, weekly average) from April 1990 to June 2017. Does that imply the right moment to buy? Let's figure it out, analyzing the supply and demand dynamics of the platinum market. The above-ground stocks amount to about 2 million ounces, which corresponds to only about one-third of annual mining production and about one-fourth of total supply (almost 2 million ounces are recycled, mostly from end-of-life automobiles). Importantly, about 70 percent of global platinum is mined in South Africa (in particular, in the Bushveld Igneous Complex). The rest of the metal comes from Russia (12 percent), Zimbabwe (8 percent), and North America (6.5 percent). The concentration of platinum production in emerging nations implies that the white metal may be prone to price spikes due to supply disruptions. Given all the problems challenging the mining industry in South Africa (labor strikes, constraints of power, low spot price of platinum and reduced capital expenditures), the supply of "rich man's gold" is not likely to increase meaningfully over the next few years. Indeed, in the first quarter of 2017, the total platinum supply was 1.75 million ounces, a decline of 4 percent year-on-year. Based on that dynamic, the supply of platinum is projected by the World Platinum Investment Council (WPIC) to decline by 2 percent from 7.9 million of ounces in 2016 to 7.7 million ounces this year. The drop in the supply of the white metal is supportive for its price. Total demand for platinum in 2016 amounted to about 8.3 million of ounces. It was made up of four core segments: automotive (41.5 percent), jewelry (31 percent), industrial (21.4 percent), and investment (6.1 percent). As one can see, platinum is an industrial metal rather than a monetary metal like gold. The greatest part of demand comes from automotive catalysts which are used to reduce the harmfulness of emissions. Hence, platinum prices are heavily dependent on auto sales and the situation in that sector. In the first quarter of 2017, global demand was about 2 million ounces, down 1 percent on an annual basis. Global demand is projected by the WPIC to drop 6 percent this year, mostly because of declines in industrial use (due to refinery capacity closures in Europe and Japan – industrial demand comes mainly from chemical and petroleum refining catalysts) and investment demand (as the price stabilized). According to Johnson Matthey, global demand for platinum in autocatalysts is forecast to shrink by 5 percent this year due to the Real Driving Emission legislation. It would require a wider use of SCR technology, which uses relatively low amounts of platinum relatively to the platinum-intensive NOx absorber catalysts. Hence, there might be a decline in use of the white metal in European diesel cars, which is the largest source of demand for platinum (the white metal is essential for catalytic converters used with diesel engines). With the total supply of about 7.9 million ounces and total demand of about 8.3 million ounces, the market balance was again at a deficit of about 0.4 million of ounces (the recent platinum deficits have been met by the reduction of inventories or sales from unpublished investors' holdings). However, although the market remained in deficit, the gap between demand and supply narrowed, as the chart below shows. 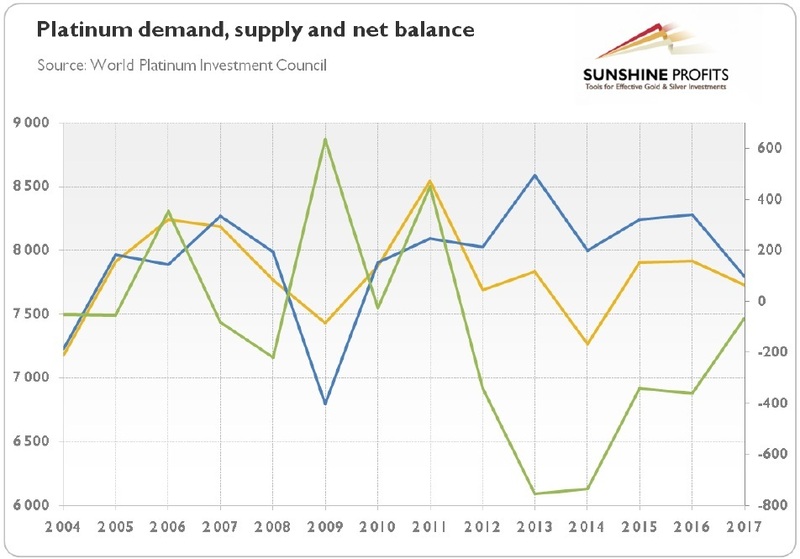 Chart 2: Platinum demand (blue line, left axis, in thousands of ounces), platinum supply (yellow line, left axis, in thousands of ounces), and the net balance (green line, right axis, thousands of ounces) from 2004 to 2017 (the values for 2017 are projected). And the net balance between demand and supply could shrink further this year (or even turn into surplus), as slower growth in vehicle production, declining diesel share and new emissions regulations stimulating less platinum-intensive technology may dampen demand for the white metal more than the likely drop in the supply. Therefore, the price of platinum could remain traded at a discount to gold. Many analysts believe in a reversion to the mean, but history does not have to repeat itself. The price of platinum does not have to be always higher than gold just because it has been traded with a premium in the past. Platinum is a more industrial metal, while gold behaves better during times of uncertainty as a safe-haven. Hence, the low ratio between platinum and gold may simply reflect the level of low economic confidence among investors. And new technologies now allow making new catalytic converters with less platinum and to recycle more of the white metal from the reclaimed materials. On the other hand, in the case of a surprisingly strong global GDP growth, the price of platinum should rise. However, even if auto sales are strong, diesel cars should continue to lose their appeal (investors should be aware that consumption of diesel in China declined in 2016 for the first time since the early 1990s), hurting the demand for platinum. Moreover, investors should remember the long-term risks for platinum: the transition towards electric cars would slash the demand for platinum. If you enjoyed the above analysis and would you like to know more about the fundamental outlook for precious metals, we invite you to read the July Market Overview report. If you're interested in the detailed price analysis and price projections with targets, we invite you to sign up for our Gold & Silver Trading Alerts. If you're not ready to subscribe at this time, we invite you to sign up for our gold newsletter and stay up-to-date with our latest free articles. It's free and you can unsubscribe anytime.